“Yes, Princess,” Darvis replied with a yawn. Clearly, he wasn’t nearly as interested in sightseeing around Voliar, the capital city of Kri. Annoyed, she folded her arms and looked out the car’s window. It was nighttime, and she saw people walking by on the city streets with the bright lights of stores and other cars beaming back at her. “I love this time of year. Don’t you, Darvis?” she asked, ignoring his previous answer about her dream man, Jin. Darvis laughed under his breath, bypassing offended feelings in favor of amusement. There followed a summer in Europe ending in the first of many happy marriages. Then graduation with University Honors, kids worth dying for and a career in business. Life is good. Author, The Phoenix Diary. Current WIP: Bob vs The Aliens . Recipient of the Psi Young award for Creative Biography. This month our featured author is L.N. Denison (aka Layla to our members). SFRT: Hello Layla, we want to know ALL about you. Everything. What? Oh I can’t expect her to tell us everything about her life? Oh well, alright, but you guys are no fun. SFRT: I have read Going Underground and it is rather bleak in outlook. You are so friendly and up beat, the subject matter in your book surprises me. Tell me why you chose to write dystopian novels? LD: I think it was after reading 1984 that I started writing Dystopia, and it was a good release for me. I have a dark mind, I grant you that, but then, so has everybody to some extent. I tend to mood write, and god help my characters if I’m in a bad mood… I’m kidding, by the way. But I must admit, I do enjoy writing the dark scenes. They seem to flow better for me than anything else. SFRT: What were your favorite books to read as a child? Have your tastes in genre changed as you’ve become an adult? LD: It wasn’t really until I hit my teens that I started reading properly. I liked the Narnia books, Lord of the Flies, and do you remember the books that you used to be able to get where you could choose which direction it went in? I had a few of those, which I loved reading. As I have aged, my tastes started to change. I found myself more SciFi and Dystopian based novels, such as 1984, Fahrenheit 451 etc. I now find myself reading a lot of independent author’s work. I think I prefer it to what’s being brought out nowadays, and I’m all about supporting indies. SFRT: What is your favorite pastime when not working or writing? LD: Well! Apart from spending quality time with the old man and the pooch, I like to go to the cinema. I do like a good film. Although, time hasn’t been on my side for the last couple of months. SFRT: What drives you to write? Do you want to make a career out of your novels so you can write full time? LD: I have so many ideas that I need to get down, and that is what drives me to write. I’d much rather my stories were out there for everyone to read, than be stuck in my head for an eternity. As for whether I would want to be a full-time writer? It is a dream of mine, but highly unlikely that it would happen. I think it’s all the aggro of getting an agent, and all the faffing around involved. I think I like things the way they are at the moment. But what’s to say that I might not try in the future? SFRT: What would you do first if you were contacted by a production company that wanted to turn your books into a movie or TV series? Would you want to be involved in the process? Who would you choose to play your characters? Oh, the former, definitely… I would want to be a part of the production. If they were going to use one of my stories, I would want to oversee everything, as it would need to be filmed to my original vision. I would want some input with the script as well… and maybe a cameo…do a ‘Stan Lee’. In all honesty though, I think I would be a complete and utter nightmare, and they’d scrap the project after a week. Thank you Layla and best wishes on your new book release. For our readers you can Pre-Order Hyde’s Lament now on Amazon. L.N. 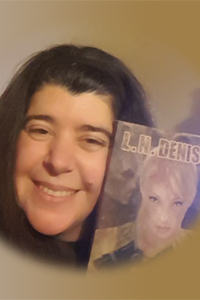 Denison (AKA Layla Pinkett) is an independent author from Kent, who lives with her husband, Dave, who has managed to put up with her for nearly 20 years, and her Saint Bernard, Max. She mainly writes dark dystopic stories, but has entered into a new, lighter type of story, which will be available the first quarter of 2018. When she’s not writing, L.N. works as a Butcher/Fishmonger at the local supermarket, which is good, but she’d much rather be writing =D.